TORY & KO. were commissioned by the former Governor-General of New Zealand to produce a bespoke piece for her Majesty the Queen for her 90th birthday. Working alongside a New Zealand carver they created a bespoke pounamu fern brooch with graduating grain-set diamonds set in rose gold. The commission for the Governor-General of New Zealand for Her Majesty Queen Elizabeth II's 90th Birthday. TORY & KO. Jewellers created a rose gold and diamond brooch which transformed a beautiful pounamu carving of a fern. His Excellency Sir Jerry Mateparae and Lady Janine Mataparae presenting Her Majesty Queen Elizabeth II with the Bespoke brooch. during her Royal Tour of New Zealand in April 2014. Pieces from the TORY & KO. Pretty Collection were selected to go with particular outfits. Sky Blue Topaz Drops suspended in Sterling Silver setting under Gold Bows featuring a tiny seed pearl. Pale Lemon Citrine drops suspended in Sterling Silver setting under Gold Bows featuring a tiny seed pearl. Large Cultured Pearl strung onto an 18ct White Gold Wheat chain with tiny grain-set diamond wheel keepers. Beautiful Cultured Pearls dangle from 18ct White Gold Marquise-shaped drops grain-set with diamonds. While most fans will be looking out for the baby prince when the royals arrive tomorrow, two women will be hoping to glimpse the Duchess of Cambridge's ears. Wellington based TORY & KO. 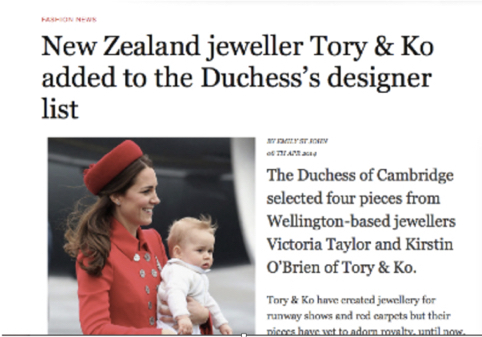 Jewellers, founded by Victoria Taylor and business partner Kirstin O'Brien, have been asked to supply four pieces of jewellery for the Duchess of Cambridge to wear on the royal tour which starts tomorrow. 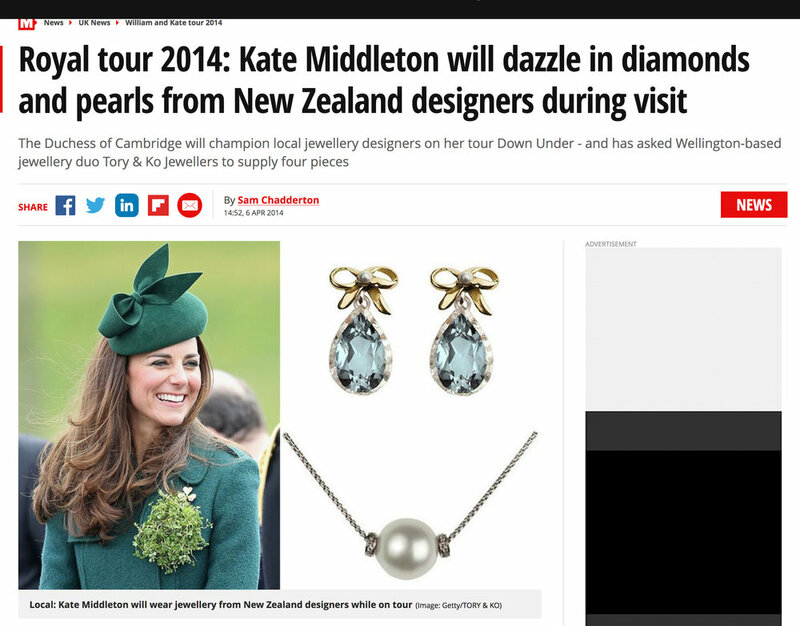 Duchess Catherine selects NZ Jeweller's collections.